Printable Coupon Alert: $.50/1 Oscar Mayer Lunchables with Fruit! 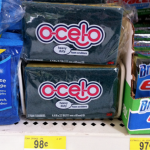 You are here: Home / printable coupons / Printable Coupon Alert: $.50/1 Oscar Mayer Lunchables with Fruit! My kids love Lunchables and I have to admit that sometimes I like the convenience of being able to throw them in lunchboxes rather than making a lunch when I’m running short on time in the mornings! 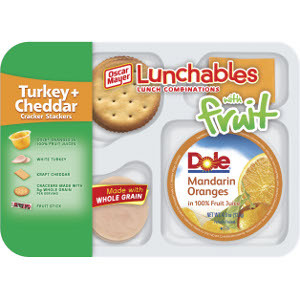 There is a new printable coupon for $.50/1 Oscar Mayer Lunchables with Fruit. Coupons for Lunchables don’t come along very often, so hurry and print this one before it’s gone! 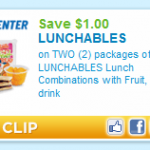 Printable Coupon Alert: $1 off 2 Lunchables with Fruit! Printable coupon alert: $1/2 Lunchables w/ fruit! 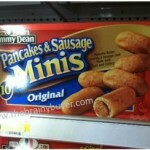 Target: Lunchables w/ fruit $1.99 each after coupons! Target: Lunchables w/ fruit $1.39-$1.69 after coupons!